My wife found this and we made when Mark and Missy came up from DC, we had no cranberries so we tried it with tart dried cherries. This was great, I mean really good. I asked Marie if I could use her pictures and post she said no problem. You can find more of her recipes here citronlimette, it is a nice site with some great recipes and ideas. Thank you Marie for this great treat! 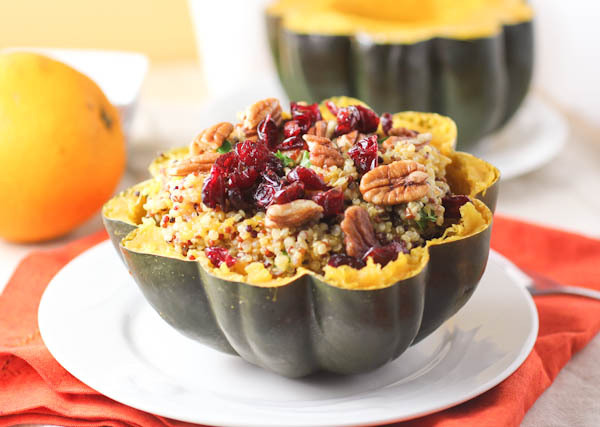 Seasonal acorn squash stuffed with quinoa. pecans and cranberries is my idea of a healthy vegetarian meal. 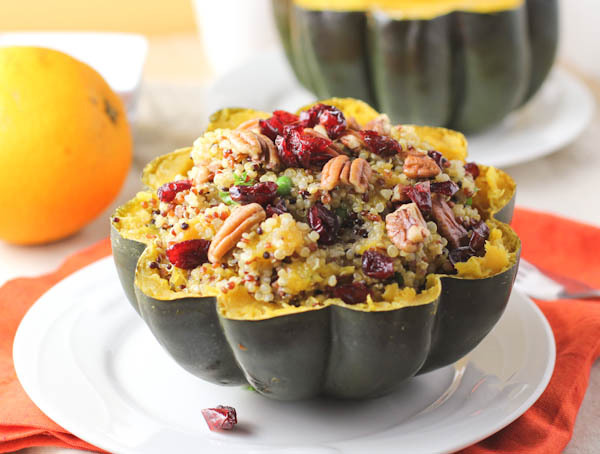 This recipe for orange quinoa stuffed acorn squash is easy to prepare and a real feast. 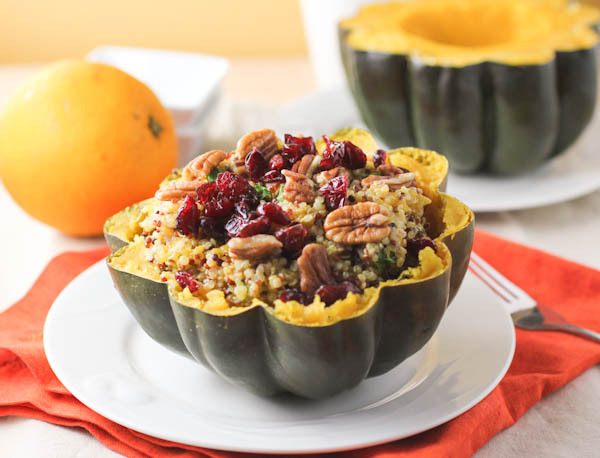 I love the sweetness of the squash and the nuttiness of the quinoa. Quinoa is addictively delicious. Quinoa is usually treated like a grain or starch, cooking up like rice or pasta in a fraction of the time. Choose squash that are heavy for their size and have a hard, deep-colored rind free of blemishes or moldy spots. Once the seeds are removed, winter squash can be baked, steamed or simmered. Preheat oven to 425 degrees. Line baking sheet with parchment paper or foil. Rub squash flesh with 3 tablespoons oil and place face up on baking sheet. Roast 30-35 minutes or until flesh is easily pierced with a knife. Remove from oven and cool. Meanwhile, in saucepan bring broth and orange juice to a boil; stir in quinoa, lower heat and simmer, covered until ready. When quinoa is done cooking, turn off heat. In medium pan, heat remaining 2 tablespoons oil over medium heat. Add onion and celery and sauté until soft and translucent, about 6 minutes. Add garlic and thyme and sauté an additional 1 minute. Add onion mixture, cranberries and pecans to cooked quinoa and toss until combined; add salt and pepper to taste. Fill each squash half with quinoa mixture. Drizzle with a bit of maple syrup before serving, if desired. This entry was posted in Main Course, Vegetable, Vegetarian, Vegan, Vegetables and or Vegetarian and tagged Cook, Dried cranberry, Fruit and Vegetable, Home, Maple syrup, Pecan, Quinoa, Winter squash. Bookmark the permalink.